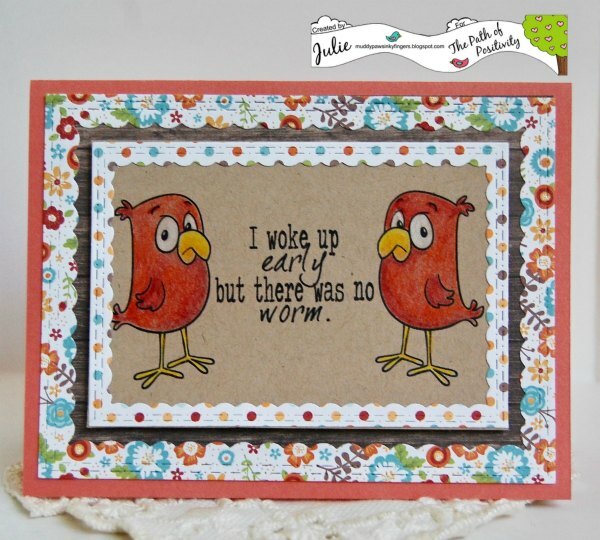 Julie, this is so funny - those are great birds. Love those dies. Wish you lived just a little bit closer so we could get together to share supplies, hehehe. Love those papers and colors! My grandparents had birds when my dad was little. I remember them going to state parks and conservation areas to see birds. They had a beautiful bird bath outside their business. My dad inherited their love of birds and built the most amazing bird feeder "with one hand tied behind his back" . hahaha Actually, he had a stroke and made it with only his left hand! He is in a nursing home now and has a bird feeder outside his window. Birds are a great connection to nature for him now.